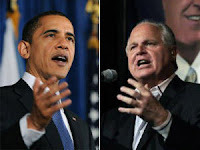 I'm going out on a limb and guessing Obama doesn't take Limbaugh up on his offer. Your thoughts? Seizing the offensive in his ongoing war of words with the Obama administration, radio giant Rush Limbaugh is challenging President Barack Obama to appear on his program “without a teleprompter” for a straightforward debate on issues important to the American people. “But I have an idea,” Limbaugh said, “if these guys are so impressed with themselves, and if they are so sure of their correctness, why doesn't President Obama come on my show? We will do a one-on-one debate of ideas and policies. . . They're claiming they wanted me all along. They wanted me to be the focus of attention. So let's have the debate! Limbaugh suggested additional topics as well. “Let's talk about massive deficits and the destroying of opportunities of future generations. Let's talk about ACORN, community agitators, and the unions that represent the government employees which pour millions of dollars into your campaign, President Obama. Let's talk about your elimination of school choice for minority students in the District of Columbia. Let's talk about your efforts to further reduce domestic drilling and refining of oil. Let's talk about your stock market,” he said. The talk show host added he would send his private jet to pick up Obama, and would pay for all expenses so taxpayers would bear none of the cost. Referring to news reports that he is trying to marginalize the Republican Party and expose its dearth of leadership, Limbaugh compared the strategy to Nixon-era dirty tricks. And he listed others who he said are being targeted by the Obama administration. Republicans are coming to Limbaugh’s defense en masse. Karl Rove, commentator and former adviser to George W. Bush, charged Wednesday on Fox News that the Obama administration is practicing “misdirection” in its attacks against Limbaugh to divert attention from a $410 billion spending bill laden with special-interest earmarks. Rove described the tactic as “old-style politics” that fall short of Obama’s campaign pledge to elevate the nation’s political dialog. And he questioned the administration’s priorities. “The idea that the White House is devoting all this time and energy and effort when we’ve got all these myriad problems facing the country, that they’ve got senior aides in the White House gaming out how they can make Rush Limbaugh the headline in the evening news seems to me to be a little petty, small, and really inappropriate,” Rove said. In an op-ed in Thursday’s Washington Post, House Minority Leader John Boehner, R-Ohio, charged Obama is trying to make Limbaugh the issue to distract voters from GOP proposals on fixing the economy. “This diversionary tactic will not create a single job or help a single family struggling in today's economic crisis. And that is where our focus should be,” Boehner wrote. There was no immediate response from the White House regarding Limbaugh’s offer to debate the president.